Both the joy and peril of music and attempting to explain how or why it’s good to someone else can often be found in the language employed to accomplish the act. It’s strange how it can work sometimes; like some words and combinations of them sound exciting but, when one really attempts to break it all down, it quickly becomes confusing. For example (and this word appears predominantly on Greg Laswell’s new album, Everyone Thinks I Dodged A Bullet), how does one qualify an artist or album as â€œuncompromisingâ€ as one attempts to describe it? Does this mean the artist is difficult to work with? Have they a sense of artistic tunnel vision and are unwilling to see any possibility outside of that narroed view? What are the qualifying elements for the term â€œuncompromisingâ€ in this context, and how or why is it seen as a good thing? 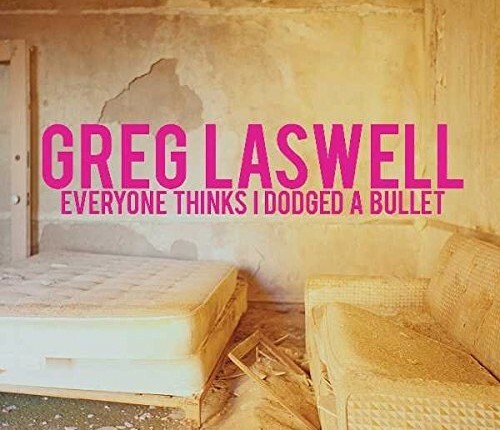 If your knees didn’t just get weak at that reader, check your pulse because no artist (other than maybe Leonard Cohen) has so perfectly set unsuspecting listeners up to fall in love with his music Greg Laswell has here in years. The song continues after that â€“ as they do â€“ but that hook sunk deep and true; this song doesn’t need a second. While â€œDodged A Bulletâ€ only needed one hook to get over with listeners and really put the album on the right path at the same time, that single hook proves to be the first of many which appear elsewhere in the running of Everyone Thinks I Dodged A Bullet. While some tracks occasionally skirt triping into dour and irreconcilable climes (â€œNot The Same Manâ€ teeters on the ege of A Farewell To Arms-level depression and listeners will find they quietly hope that â€œPlay That One Againâ€ doesn’t actually get repeated because it falls pretty close to the most overwrought extreme of Coldplay’s songbook) the album makes the most of inhabiting that place where brutal emotional examination meets a wry smile of resigned acceptance. Needless to say, the formula’s not perfect here but, even so, songs like â€œOut Of Line,â€ â€œAnd So I Tried To Sleepâ€ and â€œBirthday Wishâ€ each work at warming listeners’ hearts with the consistent ‘Everything’s not lost yet!’ vibe which runs through them. That proves to be a great plus for the album but, perhaps because Laswell knows that the edge he’s occupying is an attractive one, he also doesn’t deviate too far from it. Some critics may call the ten tracks which comprise the album same-y but, upon repeated listens, they may find their minds will change as they discover the delicacy of the writing and the care put into each performance. Even with that said though, there’s no doubt listeners will find themselves hoping for a change of pace after the album cycle behind Everyone Thinks I Dodged A Bullet ends and the possibility of new music begins to materialize. This album’s good, but another in a similar vein would be too much. It’s for that reason listeners may find they’ll be awaiting Laswell’s ‘new what next’ excitedly; everyone loves a bit of darkness in their music, but too much can just be overwhelming. After Everyone Thinks I Dodged A Bullet, more of the same would definitely reach that point.